The PMI team had a good week attending the recent International Partnering Forum for Offshore Wind in Princeton, NJ. The exhibit hall, networking opportunities, and especially the B2B meetings with supply chain partners were great opportunities to meet with other developers, cable manufacturers, contractors, and installers. While this conference doesn’t have as much of an international draw as some other tradeshows, it still provides a worthwhile meeting for domestic innovators and leaders in the Offshore Wind industry. Many of PMI’s products are versatile and are valuable for use in offshore wind, along with other sectors including marine engineering/operations, telecommunications, and the renewable energy market. Meeting with engineering, construction, manufacturing, and consultant companies gives us a great opportunity to show how PMI’s “No Tools/Prep Required” cable products can eliminate many of the stressors associated with subsea and offshore cable operations. 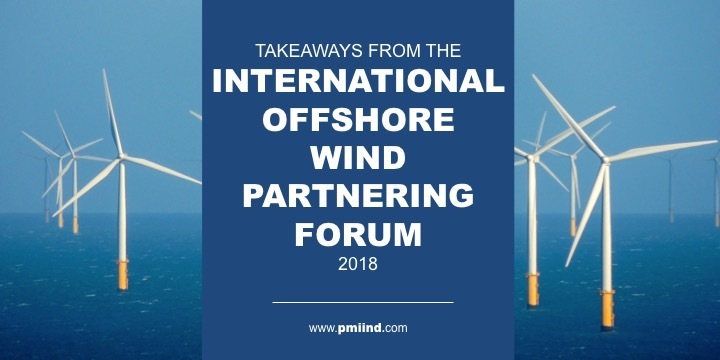 Much of the conference buzz revolved around the excitement at the increasing opportunities for renewable offshore wind projects in the United States. (Several upcoming projects seem to be located around the East Coast: New Jersey and Massachusetts.) Offshore wind farm possibilities are also becoming more of the norm. In the midst of all these advances, however, is the need to develop solutions for “lighter” and less costly cable solutions. While meeting with some of the leading, innovative companies, we were able to learn about the industry’s most pressing issues and challenges related to offshore and subsea cable operations and explore how PMI could assist with their efforts, such as working to minimize the damage to inter array and export cable installation and post damage cable repair. PMI is proud to be a part of such an innovative industry, and has a proven track record for delivering market solutions such as these for over 50 years.